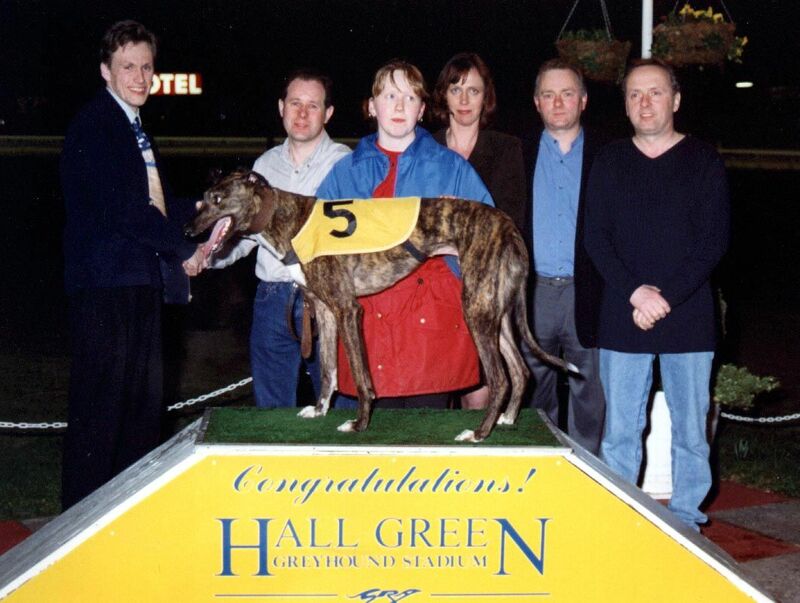 Hearing in the last week about the closure of Birmingham’s Hall Green Greyhound stadium it made me remember of a time I went there a good few years ago. At the time of writing this the owners of the stadium Euro Property Investments have formally applied for planning permission for 210 homes, the council says they had no objections to the planning but there is a campaign to “save our Hall Green” and people can sign the online petition via the save the hall greyhound stadium page on Facebook click HERE to go sign the petition. Not sure of the year but was the late 90’s, the company I was working for at the time sponsored a race event. Part of the evening was that when it was the race that we sponsored a representative of the company had to go and present the award for the winner of the race that we sponsored. It was decided that that would be me. So the photo at the top of this article is me (on the left) presenting the award. I was a really nice evening. To be honest this was the only time that I have been to Hall Green dog stadium or for that matter any other greyhound stadium. I even used to drive past Perry Barr stadium every day for around 7 years in a previous dog but never went. This is not to do with me disagreeing with dog racing as personally I don’t have a problem with this. It just really im not a gambling man, other than like most people have a bet every year on the Grand Nation horse race. This goes back to when I was really young and remember that I was a annual event in the family of getting the newspaper and choosing a horse to bet on and my father going to the bookies and placing a bet if I remember right we used to put 50p each way on about 3 horse that we picked. I have fond memories of this. Yes it is a shame that now we are losing a lot of sporting stadiums not just dog racing but speedway tracks etc. but times have moved on and not as many people now go to sports events like this. And in this day land is worth a lot more money for housing developments. The same could be said about pubs and even petrol stations as when I started to drive there was loads of independent petrol stations in our area now in the area I live, we mainly just have a supermarket petrol station. But like any business if they can’t make money they will close and with that the loss of old building etc.